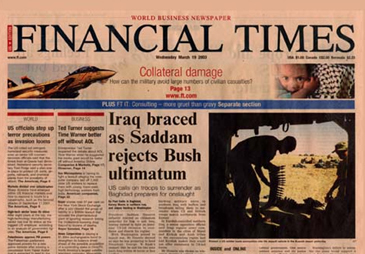 The Financial Times on March 9, 2006 announced the inaugural FT Asian Financial Centres Summit will be held in Seoul on April 12 and 13, 2006. Sponsored by Seoul Metropolitan Government and American International Group, Inc. (AIG), this exclusive event will feature keynote addresses from Dr Alan Greenspan, former US Federal Reserve Chairman, Mr. Rudy Giuliani, former Mayor of New York and Chief Executive of Giuliani Partners, LLP, Yoon Jeung-hyun, Chairman of Financial Supervisory Commission and Governor of Financial Supervisory Service and Kwon Tae-shin,Vice Minister of Finance and Economy, Korea. Held at the Grand Hyatt Seoul, this high-level summit will discuss the opportunities and challenges faced by major financial centers in Asia. "Asia's financial markets and the effective allocation of capital are crucial factors in sustaining the region's economic dynamism," said John Ridding, editor and publisher, Financial Times Asia. "Financial intermediation within Asia and between the region and other major financial centres is of central importance to the global business community and we are delighted to bring together senior leaders from the public and private sectors for this discussion and debate." The springboard for the Asian Financial Centres Summit is South Korea's own ambitions to become the asset management hub of Northeast Asia and a major Asian financial centre of equivalent standing to Hong Kong, Singapore and Tokyo. At the core of this plan is the bustling capital Seoul, already a centre for high technology and innovation, which is now seeking to transition itself into a financial powerhouse. According to Seoul Mayor Lee Myung-bak, "We are honoured to be hosting this prestigious event, organised by the Financial Times. The Summit will serve as a useful discussion forum for the critical issues that we and other financial cities in Asia need to understand and address if we are to achieve our goals. With the impressive platform of respected international speakers attending the conference, we are looking forward to the same high calibre of informed debate and lively analysis as is evident in the pages of the FT on a daily basis."